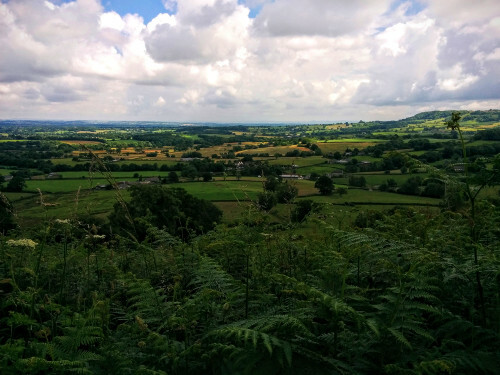 On the last weekend in June, I ran (and walked) the Giants Head Marathon in West Dorset. Well-organized, welcoming, laid-back, and not so simple to get to. Highly recommended. Continuing my theme of exploring England this year by travelling to running events, I made my way to West Dorset. This is where the annual Giants Head Marathon is held. The onward journey was a bit adventurous, just managing to catch the last train at Clapham Junction (which was luckily delayed by a crucial 3 minutes) on Friday evening. Yoda might say: Great planning, it was not. I arrived close to 11pm at the train station of Maiden Newton, a village in West Dorset. I checked whether there was any taxi, but there wasn’t so I decided to walk the last four miles instead. Having a rough idea of the bearing, a close look at the satellite map, and a sign of a public footpath in the right direction, I started walking. Fortunately, a colleague had lend me her portable charger, so the torch of my mobile phone was quite useful to illuminate the footpath through the fields in the dark. I made a mental note that my cheap headlight was useless when compared to the torch of my mobile phone. Great planning, it was not. With modern technology however, the adventure becomes less adventurous. When I got close to Sydling St. Nicholas, a flook of sheep ran away from me (sorry for waking you up!). Also a few cows got a bit nervous, which made me a bit nervous (who knows how pissed off they were after having been woken up), and I backtracked a bit. Finally, thanks to good sign-posting I found the campsite, and despite best efforts, in contrast to everyone else, I put my tent in a random spot in the dark rather than following the somewhat orderly rows. Anyways, there was so much space. The camping is a great thing. You can camp for one or two nights, more or less right next to the start/finish line. It cost me £10 a night, and the money went to restoring the local church. All there was to do is to wake up in the morning, get a few snacks, and collect the race number. No queues. Great planning, that was. I really like the small races in the country side. No blaring loudspeakers, not much pre-race entertainment via loudspeakers, just a briefing, gathering at the start line and a simple call to signal the start. Simple as that and wonderfully effective. Loved that. I think, my appetite for races in cities is now completely lost. After all, if I can have all of this? Thanks to the lovely organisers of the race. Hopefully, I’ll be back. Plus a big thanks to the fellow runner who, after a bit of asking around, gave me a lift back to the station. Offer other hitchhikers a lift in the UK – check. 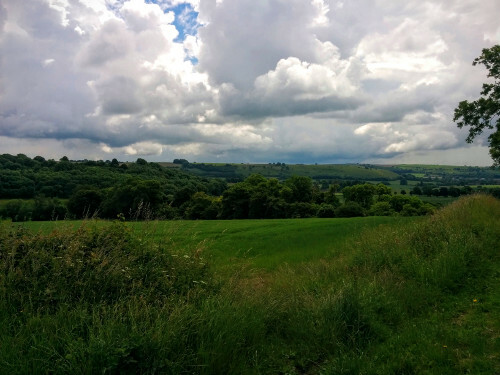 Hitchhike myself in the UK – check. 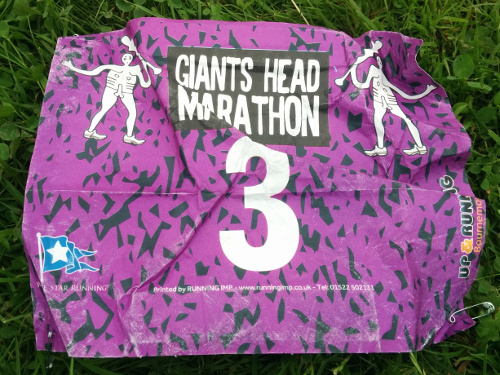 Giants Head Marathon. It was a pleasure.